This time around the first thing we noticed was the service. It was excellent. We were looking sheepishly at the tables in the sun when the waiter offered to bring out another table out for us. We were impressed. He was not only friendly but helpful. Service is not a high point of Sydney’s café scene and it’s nice to feel welcome in a place even if you’re not a local. We basked in the sun on the quiet pier at Pyrmont and enjoyed the water views. The café is only open during the day so they specialise in breakfast. 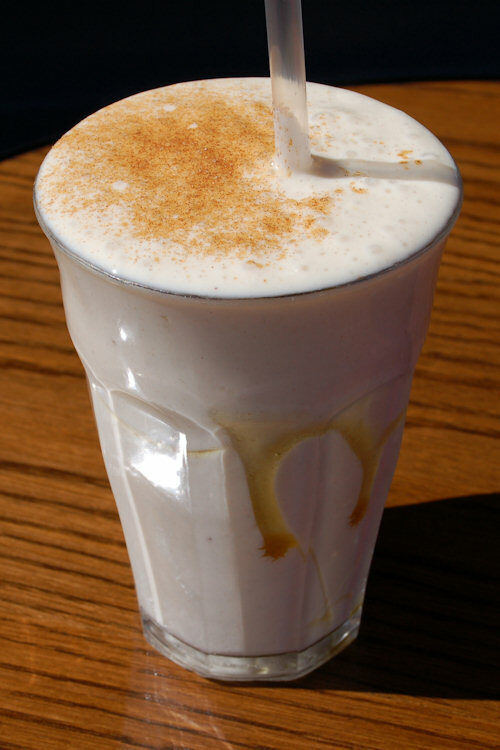 The banana smoothie ($5.50) was a treat of perfectly harmonious flavours. Honey and yoghurt are added to the blend with a dash of cinnamon throughout to really bring it together. We would order this again in a flash as it was a hit with everyone. 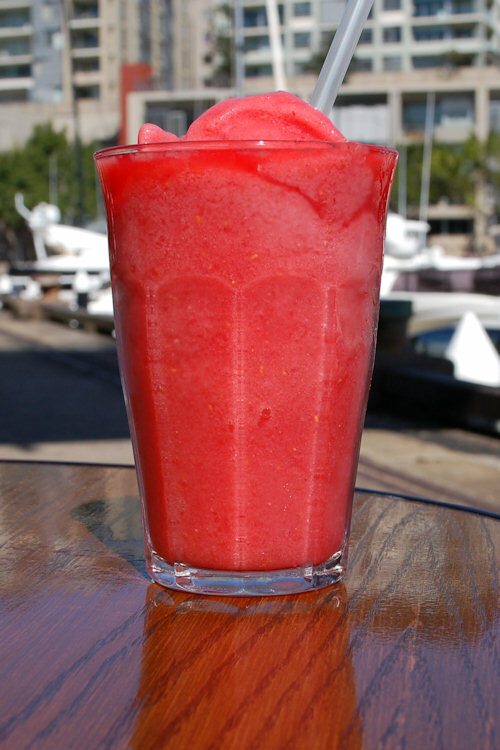 The raspberry and strawberry frappe with lime ($6.50) was icy cold, perfect for a warm morning. It was fresh and thirst quenching and was an improvement on last time as it was less watery, probably because it was served straight after it was made. The coffee by karmee was spectacular. 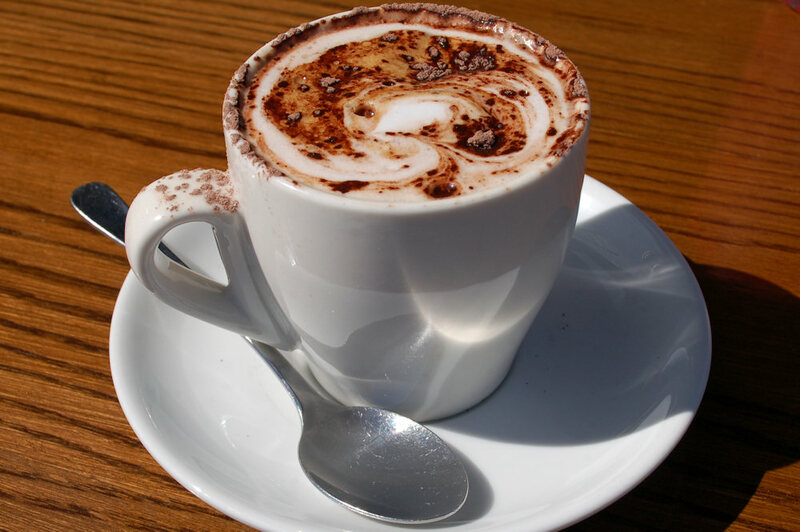 The blend can be recommended for it’s great flavour as our skim cappuccino ($3.80) left us wanting more! We spied the guests next to us eating avocado and house cured salmon, lemon, extra virgin olive oil and toast ($15) and we had to have it. The high quality olive oil on the side added a great flavour to the dish and combined well with the avocado and salmon. Little did we know that we ordered the same last time. It exceeded our expectations and the side of roasted field mushrooms ($3) complimented the dish well. This is one of April’s top 3 breakfasts and there was no food left on the plate at the end! 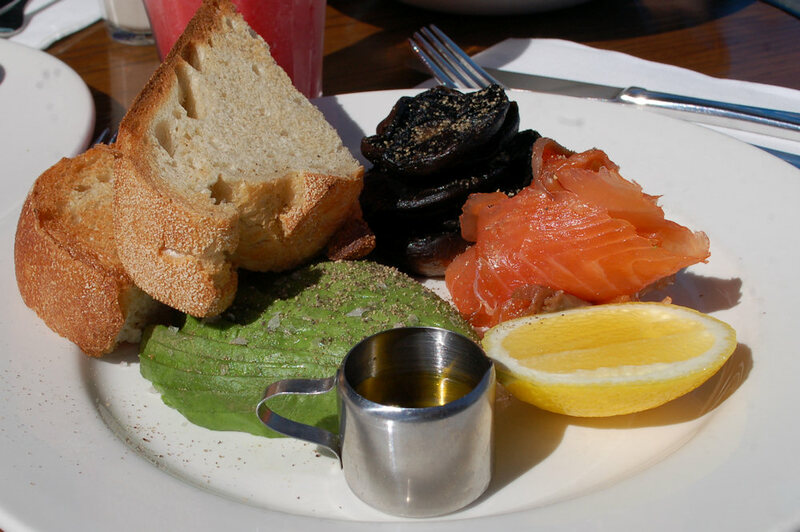 How utterly refreshing to find a unique breakfast dish on Sydney’s café scene. The bacon and egg gnocchi with baby herbs and tuffle oil ($14.50) had us intrigued and we can say that it works exceedingly well. The long gnocchi was soft in texture and and melted in our mouths. 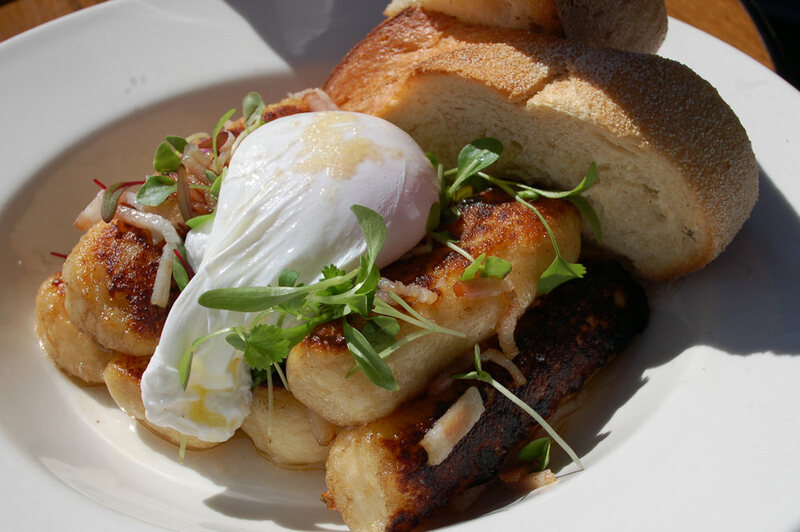 Be sure to crack the poached egg over the gnocchi as the combination completes the dish. 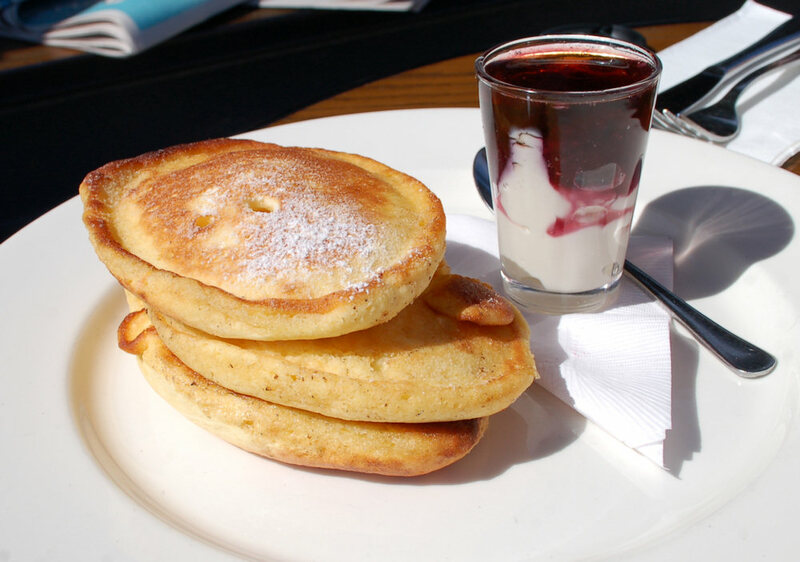 The orange pancakes with yoghurt, mixed berry compote and maple syrup ($14) is Dane’s favourite breakfast dish in Sydney. Since he doesn’t usually like sweet foods this is pretty amazing. The dish is presented in a more sophisticated manner than before which makes it look good, but we preferred it with the berries poured over the top. When served like this the berry flavour infuses the pancake and makes for a divine meal. The orange pancake recipe is somehow different to all others that we’ve tried. We’ll have to come back in a few months and see if they change it again. Morso at home products available which is a great idea to promote the ingredients that make their dishes so spectacular. The range includes: tomato relish ($9.90), mixed berry compote ($12), red onion jam ($9), toasted muesli ($13), chocolate and walnut brownie ($8.50) and white chocolate & almond slice ($8.50). Their menu boasts a few noteworthy achievements (listed below) and it’s not hard to see why. You can also book Café Morso for a cocktail or dinner party. 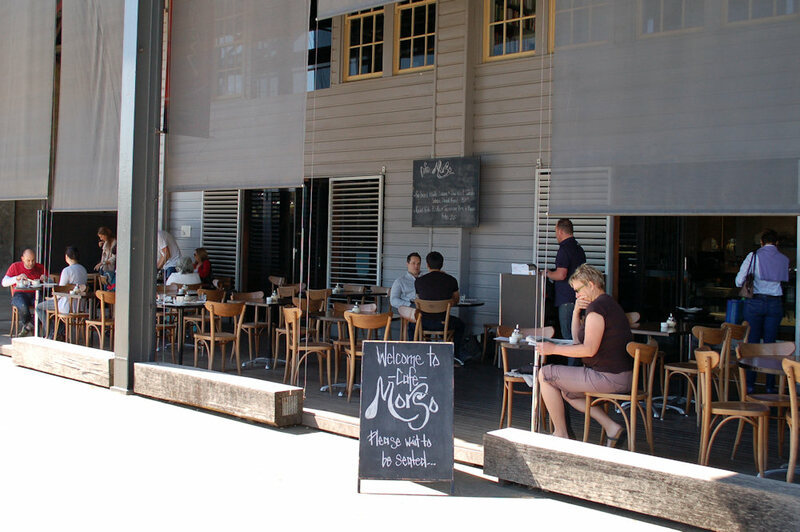 This entry was posted in Sydney - CBD and tagged Dog friendly, Outdoor seating, Parking close by, Water views. Bookmark the permalink. That place sounds awesomely delicious!